Nigel Reo-Coker has been sent home from training and dropped from Aston Villa's squad for the game against Portsmouth on Saturday for disciplinary reasons. 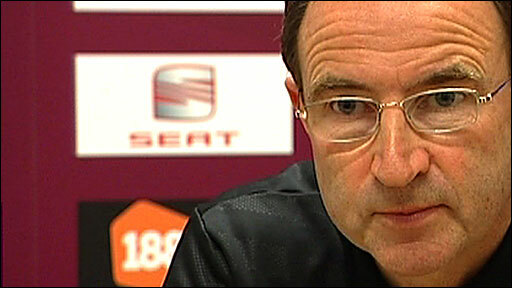 Villa boss Martin O'Neill admitted he had a "strong verbal disagreement" with the midfielder at training on Thursday. However, O'Neill denied newspaper reports of a physical confrontation. "There was a mishap on the training ground," he told the Aston Villa website, adding that Reo-Coker would be back in training on Monday. "It's a common occurrence between players but on this occasion, unfortunately, it was between the manager and a player. "There was a bit of a contretemps and that is unfortunate. Nigel didn't train this morning and obviously won't play tomorrow. "There were no fisticuffs. There was no wrestling to the ground as reported in one newspaper. That was a figment of the onlookers' imagination. "I have dealt with the issue how I see fit and that's the end of it. Come Monday, we're back to normal again. I am the custodian of this place - my rules apply." O'Neill also said there was no prospect of the former West Ham player being placed on the transfer list.